It is common for homeowners who’ve lost a home to foreclosure to feel a certain sense of defeat—and even a little fear—when it comes to trying to buy another home. Frankly, nobody wants to default on their mortgage and lose possession of their home even once, let alone think about going through it again. But once the market conditions, personal circumstances or financial situation that led to a homeowner going through a foreclosure change, there is hope for buying another home. The bottom line is that buyers who’ve gone through a foreclosure should be prepared to do a little more work and show a little more proof that they are financially ready to own a home again. 1. There might be a waiting period. If you’ve gone through a home foreclosure, the chances are good that you won’t be ready to turn around and buy a new home within months or even a year or so. The reality is that you likely wouldn’t be able to do so anyway. Lenders typically require buyers who’ve gone through foreclosure to wait anywhere from three to seven years before trying to purchase a new home. This waiting period gives buyers plenty of time to bounce back and improve whatever financial circumstances led to their foreclosure. 2. You’ll need to prove your financial situation has improved. As buyers look to purchase a home after a foreclosure, they can use a waiting period to improve their financial situation. Like other home buyers, this is the time to work on paying down debts, saving money and improving your credit score. Because any lender will be aware of a previous foreclosure, buyers who want to purchase a home again might have to show several months of cash reserves on hand, whereas other home buyers might not be required to provide such stringent financial proof to qualify for a mortgage. 3. You should be able to explain any financial hardships. Buyers who are trying to purchase a home after a foreclosure can expect to provide increased documentation. Foreclosures can happen to anyone, and lenders do understand that. But that doesn’t mean your lender won’t want to know about your personal experience when it comes to going through a foreclosure. 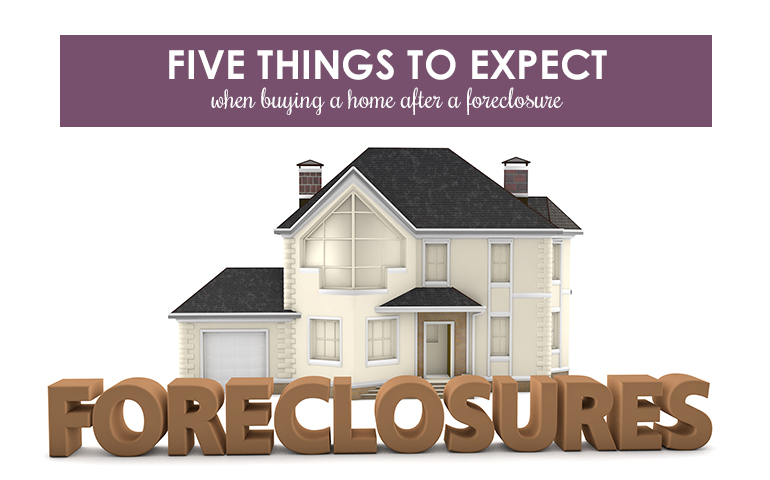 Be prepared to explain whether it was a job loss, medical issue, market conditions or other circumstance that led to your foreclosure. It might be hard to talk about the situation, but it could help you qualify for buying another home. 4. You might need to shop around for the right lender. This is advice given to every home buyer, but it is particularly true for buyers who have been through a foreclosure. If one lender won’t offer you a mortgage, shop around for another – and another if you need to. Every borrowing institution has varying requirements when it comes to loan approval. Don’t be discouraged if the first lender you seek out is not willing to offer you a loan. 5. You could face a higher interest rate and down payment. When you are shopping around for the right lender after a foreclosure, you might notice that the terms offered differ from those offered for other buyers. You could be required to pay a higher interest rate or provide a larger down payment in order to purchase another home. This is another reason why a longer waiting period can help you better prepare for buying again. You’ll have more time to save money for any additional mortgage requirements you might face. If you’ve gone through a home foreclosure and you are ready to begin searching for a new home, let us help. Contact a trusted professional at Berkshire Hathaway HomeServices The Preferred Realty today.